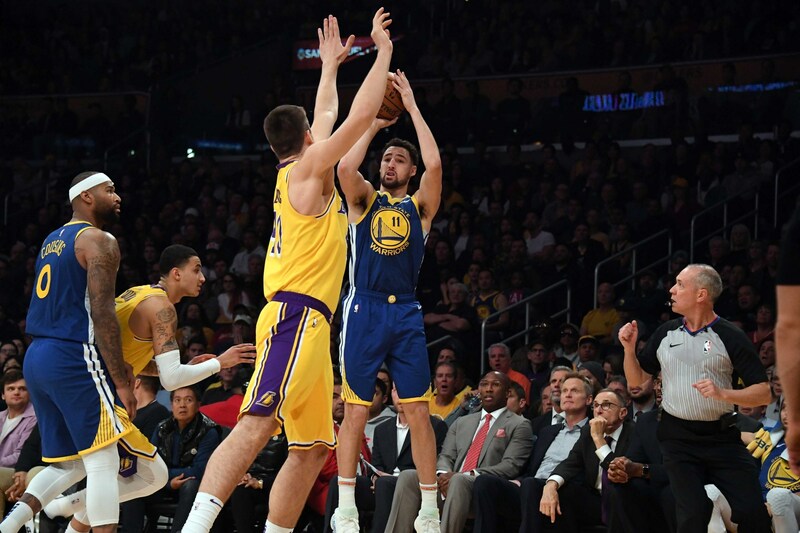 LOS ANGELES - Nothing could stop Klay Thompson, certainly not the Lakers’ defense. 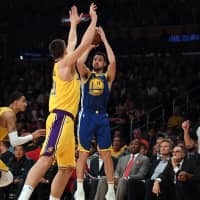 In Memphis, Jrue Holiday and Nikola Mirotic scored 21 points, Jahlil Okafor and Julius Randle had 20, and balanced New Orleans beat the Grizzlies without injured star Anthony Davis. Okafor set a season high for points and added 10 rebounds filling in for Davis. Randle had 12 rebounds and Holiday grabbed 11 as New Orleans out-rebounded the Grizzlies 50-35. It was the Pelicans’ first game since announcing Davis would miss 1-2 weeks with a left index finger sprain. Memphis rookie forward Yuta Watanabe came off the bench and played nearly six minutes. He was 0-for-2 from the floor and didn’t score. The George Washington University alum was called for two personal fouls. In Philadelphia, Joel Embiid had 32 points and 14 rebounds to lead the hosts past fellow MVP contender James Harden and Houston. Embiid’s 24 first-half points helped the Sixers to a 65-50 halftime lead, and he punctuated an entertaining opening 24 minutes by pinning Harden’s layup attempt with 7.5 seconds left for a crowd-pleasing block. The duo had to be separated with 38.7 seconds left in the half, with each being issued a technical, after Harden took exception to Embiid’s foul on him. In Boston, Kyrie Irving had 26 points and 10 assists, Al Horford added 16 points and 12 rebounds and the Celtics beat Miami for their fourth straight victory.